Throughout like a majority of us have muttered the words, “I regret doing that” or “I regret not doing that.” They are words that have become part of our common language. As they say, hindsight is 20/20. We all wish we could have done something differently at some time or another but the past is the past. Of course there are times when I daydream of what life would be like if I had taken this path or that path. But, do I regret, no I can’t say that I do. Even through the hardest and most painful times, I came out learning something. I dug a little deeper into myself and I pushed my limits just a little bit farther. I have learned a lot in this life and I believe I was one of those late bloomers. It took a lot of falling down and stupid mistakes and decisions for me to get my priorities in line. I don’t know how other people experience life…obviously. I can only make assumptions based on what I see. There are some people that I think regret so many things and they are allowing those regrets to control their lives. I have been there…I know what that feels like. 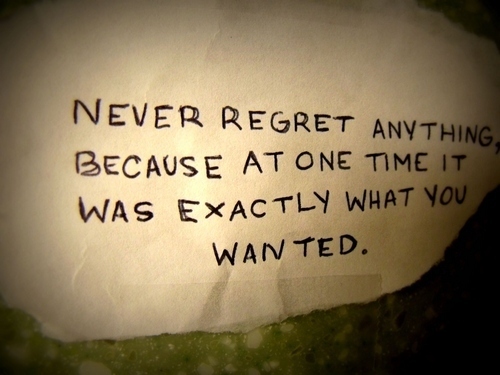 I just wonder if there are some people that are never able to see how regret serves no purpose. Ever action in life comes with a lesson. We are all human beings that are going to make mistakes at one time or another…some larger than others. Regret just feels so negative. It feels like this “emotion”(for lack of a better word) holds onto some people and they are unable to get out of its grip. What benefit is there to regret? I have been asked many times in my life under random circumstances whether I would change things in my life if I was able to go back. Honestly, I don’t think I would. If you would have asked me this question a year ago I probably would have said, “where do I sign up?? ?” but I believe I am supposed to be at this place in life. Why would I change the rules…just because I could??? I don’t believe that is the way life is supposed to work…just because we can/could doesn’t mean we should. At a very young age I started struggling with weight and for more years than I can even remember I HATED my body and I fluctuated in weight…up and down and up and down. It may sound silly to some but I believe I needed to have those fluctuations and that challenge of poor self-image to make me appreciate myself more. I am now 33 years old and I am very healthy. I have a little bit more weight I would like to lose but I have come to terms with my body and my weight and I have learned such a great deal about what it means to push yourself and to educate yourself on healthy habits….both mentally and physically. My struggle with my weight made me grow in so many different parts of my life. I could say that I wished that I started a healthier lifestyle earlier in life but that is not possible…the past is the past. I don’t regret my unhealthy choices (I am thankful of course that I did not have major health issues) because I have learned so many lessons in life and luckily I have come out on the other side…I am a beautiful woman. I no longer cringe at the sight of my “imperfect legs” or the stretch marks due to my weight fluctuations. I look at these things as marks of my journey. I don’t want to go back to an unhealthy lifestyle and I truly believe I won’t. I love your decision to no longer let regret define certain parts of your life. It takes a true understanding and acceptance of oneself to see that your life (good, bad, and otherwise) has brought you on a unique journey and given you stories only you can tell. Great post. Great post! I can’t stand being around people who keep dwelling on regrets. Since we can’t go back, we need to move forward. It should be that simple. Loved this Post! Great work!